The hardest post I have ever had to write…..
Hi friends. I am heartbroken to tell you that my beloved Teddy passed away on 9/6/17. Words cannot properly describe the gamut of emotions I am going through. A mix of extreme sadness, aching to lie down next to him as I have done every night and morning gently massaging his achy limbs, sometimes singing to him and just an immense emptiness in my heart and home, seeing his little corner bare without his precious smiling face, even when he was in severe pain. He kept a strong front and tried very bravely to keep on going just to make me happy and that was the essence of Teddy. 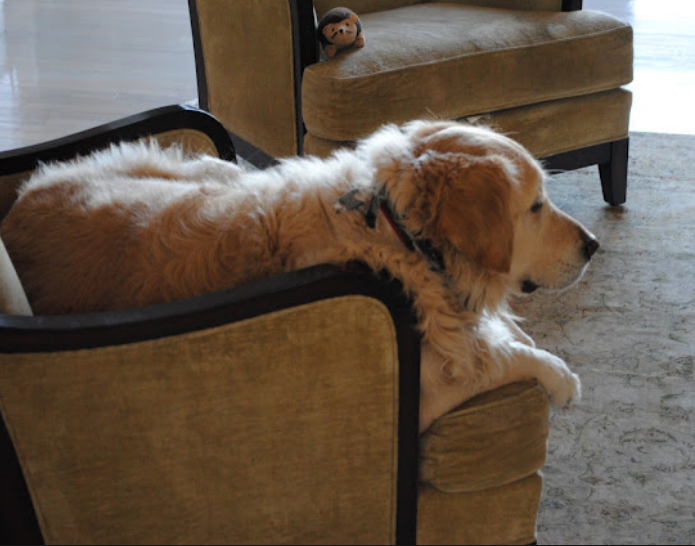 He had developed severe arthritis in the last year not unlike most goldens and lucky for him that was all he has ever had to deal with. No illness, cancer or serious issues that often plague older dogs. He was aside from that an incredibly healthy dog and truly beautiful. Sadly the arthritis in recent months really deteriorated fast and the last month has been brutal. I, being an eternal optimistic and someone who is very resilient did not want to face what was happening though the vet, Dr. Denise of Jericho Animal Hospital, someone who is trusted as a friend and professional, started telling us a few months ago we would have to consider the unthinkable. Her exact words were “he moves your soul” and she had the same angst as I, watching him deteriorate, they loved him dearly (he has been there since he was 8 weeks old) so the entire staff have come to know and love Teddy like their own. And trust me we tried EVERY medication, every kind of therapy, aquatherapy, holistic therapy, acupuncture, you name it. I would gently place him on a small rug and drag the rug with him on it by the door and open it so he could be as close as possible to the life outside he so wanted to be a part of and missed. He would sit there for hours watching and taking it all in. This, for a dog who loved nothing more than prowling and exploring outside, chasing the birds and butterflies, had to have been torturous for him and I cried every time I watched him doing this. Two nights ago he was really suffering unlike what I had previously seen and it seemed different than before, he was panting very heavily and was in obvious distress. I knew something was wrong, this was different, and immediately called his dr. and they picked him up, upon getting to the vet he had fever of 105.9 which is considered to be potentially fatal. He was having a hard time breathing and did not seem at all comfortable. Of course, with his being such a wonderful, irreplaceable companion to our entire family his whole life…the last thing I wanted to do was make him suffer just to please me. And these last few weeks that is what it came down to. I grappled with making a life changing decision but didn’t have it in my heart to do it yet I saw with each day he was worsening to the point where as of a few days ago he could not even heavily aided take more than a step. So going back to that night 2 nights ago…he was not only in serious pain with a dangerously high fever but was in major distress. He was having a hard time breathing and did not seem at all comfortable. ……as the doctor did her best to work on him, that is when I knew, it was almost like God came and whispered in my ear that it was his time, that I needed to say goodbye and that God needed him up there in puppy heaven so he could get back to the important business of chasing birds and butterflies, burying bones and enjoying life as he used to. I needed to let him go in peace and with the dignity he so very much deserved. He has given us almost 13 years of immeasurable happiness, companionship and entertainment. He has been a treasured friend to me and always a wonderful source of comfort even during some very difficult times, he was the one source of comfort I knew I could count on and did. Nothing could make me smile quite like seeing his beautiful face always waiting for me. I knew it was time for him to leave us but not in spirit and that he was ready. So, literally in my arms he passed away looking so peaceful and his expression said “thank you for letting me go, I am ready and no longer suffering”. The countless memories we have of Teddy and thankfully many many pictures and videos will help get us through this very difficult time. Seeing them makes me laugh, cry and smile all at once. I have been moved for years over the unbelievable connection so many of you from near and far felt with Teddy and trust me, it never went unnoticed. He would get gifts and toys and paintings and works of art of him from people we have never met. That was the power of Teddy:) To know him was to really love him, he was a gentle giant, a big lump of sugar who was your best friend if you had a smile to share, a belly rub to give or a special treat in your hand. His gentle soul made everyone who knew him fall in love with him. So many of you mention him in your comments and emails, always asking about him and it always made me feel so proud to be his mom. I know how much he was loved and adored. Any pet owner knows the untold joy we experience when these pets come into our lives yet the unspeakable grief when they must leave. I wouldn’t trade the almost 13 years I had with Teddy for anything in the world. Not a day will go by that I will not keep his memory alive in one way or another. I will miss my best friend, trusty companion, sous chef, fellow snowbunny, Enchanted home and family mascot, “welcome home” buddy at the end of a day more than words could ever express. I know with his many fans, many of you will keep him in their thoughts and prayers and we will gladly take them. I love you Teddy and I know heaven is rejoicing having you up there as you have gone to the Rainbow Bridge. Your spirit will live on in our family and home forever. Rest in peace my beautiful boy. Thank you for stopping by. Most definitely the hardest (teariest) post I have ever had to compose myself to write. I will be taking off the next few days to mourn my beloved Teddy’s loss. Though I do not expect to magically get back to normal next week, I know life goes on and I will do my best in his honor to persevere and move forward as he so valiantly did in his last days. Thank you four your friendship, kindness and good will. Wishing everyone a wonderful day and weekend. I’m so sorry for your loss. I’m quite certain that Teddy was met at the Rainbow Bride by Duchess, Miki & Moto, our own babies who have passed, and countless other furry friends. It is hard, and will be for awhile, but these precious photos and memories will remind you of him and keep you company. I am so sorry for the loss your beloved Teddy. Tears are pouring down my face. I’m so, so sorry. I am so sorry that you’ve lost your Teddy. This is the most difficult part of loving our animals; letting them go. You are in my prayers. You did the right thing. He always trusted to you for everything and you did. It fail him. Last year when I visited a psychic she out of the blue told me I had a little brown dog that followed me everywhere and still slept with me every night, my beloved daschund Cleo. It could be no other. So I am sure your Teddy is still there watching over you. you both were to have each other. A beautiful tribute to your beloved Teddy, Tina. My heart is so sad for you. I know the hurt is so deep. Thanks for sharing. I am so so sorry for your loss. Teddy was just adorable. It was clear that he was a cherished member of your family. My son has a Yellow Lab, Izzy, who is 13 years old and she is slowly deteriorating. I love the retrievers personalities. We always say that Izzy truly thinks she is a human. I know how they steal your heart. I pray your happy memories of your dear Teddy help you through your time of grieving. God Bless. Your post of Teddy has made me tear up. I am so sorry for your loss. I know your heart is so heavy. Blessings to you and the departure of your best friend. He was very photogenic. All your pictures of him are wonderful. Tina, I am crying as I read this and write this comment. I am so very sorry for your loss. Teddy was a beautiful dog and he has the sweetest and gentle face. I loved your posts that included his photos and antics. I remember when he was mauled by your neighbors dogs and how he rallied and went on to have any many happy years. My thoughts and prayers are with you and this painful and heartbreaking time. I know how you feel as do many. One of the worst days and the hardest of my life was letting my Munchen go. It is the best decision for them but it is so very hard as a pet parent to make. I think of my sweet girl everyday and thank God I have 14 years and 10 months of love and comfort. Your memories and photos will give you comfort. A big hug to you Tina. We will miss you Teddy but I know that you are running free, painless and happy. Oh Tina, I am so very sorry for the loss of your beloved Teddy. What a wonderful tribute to him and I couldn’t see to read it through my tears. He will always be with you and your family. Take care. He will be missed by all of us!!!!!! God Bless you & Teddy! 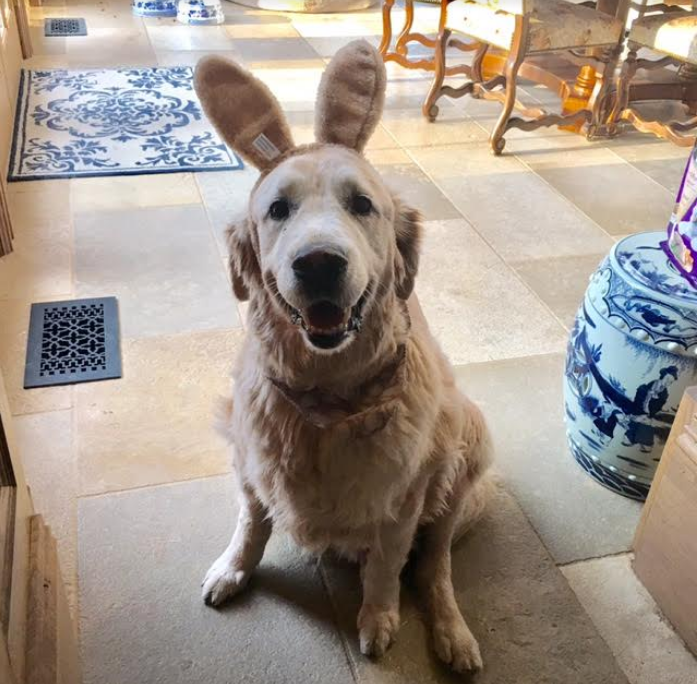 I knew this post was coming, and I dreaded it as well…even though I never met Teddy, his sweet spirit radiated through my computer screen and brought such happiness to anyone that looked upon his precious face. 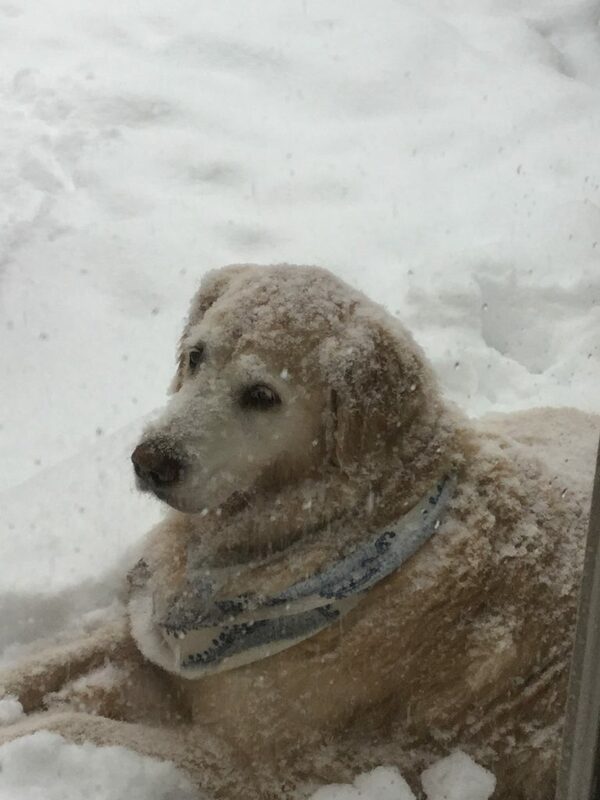 I also have an elderly golden retriever, and we are starting to see signs of arthritis setting in; I hope I can be half the mom to her that you have been to your sweet Teddy. Much love and prayers from Texas. So sorry for your suffering. Hoping you find peace soon. How close , yet not knowing you , I feel connected. God gives us the spirit connection , through the gentlest , love and dedication , our animal friends give us. Your words were so wisely , tenderly spoken. My heart hurts for all of you. I had planned that once our little guy was gone, we would travel, not be tied down. Within a week I was searching rescues. I rescued….and he rescued me. Our Sammie , 15 pounds of love , gave me the unconditional love that pulled me through. Hoping that the glorious memories will hold you up during this time. May your day be brightened by knowing so many of us have ” walked this walk” . There is light in the tunnel. I’m sitting at my desk, with tears in my eyes reading this. I am the grandmother to 3 goldens and we had to say good-bye to one last year who was about the same age as Teddy. Goldens are just the sweetest, most loving dogs ever. I have always loved seeing pics of your Teddy. He had such a wonderful life with you and your family and I know you will all miss him terribly. Take some time to mourn his loss and remember all the precious times with him. I’m so sorry. I am so sorry for your loss. Treasure those memories. I was in your position two years ago. It is not easy and you need the time to grieve. You are in my prayers. So, so very sorry for your loss. Irreplaceable, unconditional love. So sorry for your loss. From your pictures and descriptions , Teddy brought you and you family so much happiness and love throughout his life with you. May he Rest In Peace. So sorry for your loss. They are truly members of the family. Oh my gosh, sobbing as I’m reading this post. I think we all, as readers, felt Teddy was also “our dog” and loved seeing his daily adventures. The photo of him sitting in the doorway, gazing out really got to me. What a beautiful soul. As an owner of an elderly dog I know this time will soon come for me. I only hope I can handle it with the grace you have, Tina. All the best to you and your family at this very, very difficult time. Hugs. Crying as this is just heartbreaking. It’s so hard to make that decision and then to have the empty places in your home. Our pets take a piece of of hearts with them when they go. I’m so sorry. Praying that God gives you peace and comfort. I am so sorry to hear that you have lost your beautiful boy. You have so many lovely memories of his happy life, that is what you will treasure. You were lucky to have each other. Saying goodbye to our beloved pets is one of the hardest things we will ever experience. Treasure and celebrate all that Teddy brought to your life and pay it all forward. He will greet you someday at the Rainbow Bridge! Sending you love, hugs, and healing thoughts to heal your broken heart. I am here with tears for you and precious Teddy. I know exactly how it feels as I have had through the years to put down six Westies who we all adored . Like you, we took them all the way until we saw that look in their eyes that they couldn’t take anymore. I had heard about “that look” and once you see it you know. Teddy has crossed over the rainbow bridge and it is an ardent prayer for those of us who have included animals in our family that we will all be joined together some day. The sorrow doesn’t go away quickly but it slips away little by little though not fully. Time heals but there is always that pain deep in the heart. I wish you and your family well. Oh my! No matter how many times we go through this it is so heart wrenching. I’m in tears for your Teddy. I read every blog and probably look forward to Teddy pics the most😁. What a treasure you have had in your life. I’m thinking of you and hope you really know you made the best decision. Tears for Teddy and you and your whole family. So, so sorry. My heart is so sad for you. Some people don’t understand how the loss of a dog could break our hearts so but I know and feel your pain having lost our beloved Goldens and other dogs in the past. We have another one now. She was 6 when we adopted her and that will only make her time with us shorter but she is the sweetest dog. I am already dreading the day and hope it will be a very long time in coming. Your post was a touching and beautiful tribute to Teddy. It was always such a treat to see his pictures, he was special. tina, you are in our hearts and prayers. hopefully teddy will visit you in a dream very soon, to let you know how much he likes heaven. meanwhile, he will be busy— exploring , figuring out which clouds are the fluffiest, making new friends, and finding out which angels give the best treats. please keep your heart open, because teddy will send you another dog to love. you will know which one he sent when you recognize a certain look in her eyes, or a certain quirky teddy-like thing that he does. Oh Tina, I am so sorry. This just brings tears to my eyes. It breaks my heart every time we lose one of our own, because they truly are members of our family! Love the pictures in memory of Teddy. I know he was such a great pet! So very sorry for your loss, Tina. . May dear sweet, lovable Teddy Rest in Etenal Peace. He will be missed beyond measure. Holding you and family in my heart. I am so very sorry for the loss of your beloved Teddy. I too lost my beloved Lucky. It is so very heart wrenching. You will always think of him and miss him and be so very grateful for the time you had together. He is there in spirit with you always. We always say all puppies go to heaven and he is happily waiting to be reunited. So very sorry for your loss, Tina. . May dear sweet, lovable Teddy Rest in Etenal Peace. He will be missed beyond measure. Holding you and family in my heart. God Bless you all. SORRY FOR THE LOSS OF TEDDY, TEDDY WAS A BEAUTIFUL DOG. SOMEWHERE TEDDY IS IN AN ENCHANTED HEAVEN, AND BARKING WITH OTHER TEDDIES LIKE HIM. MUST SAY, THANK YOU FOR THE GORGEOUS PICTURES AND SHARING. My heart goes out to you, Tina. We give our hearts to our four legged companions, never looking down the road far enough to imagine life without them. If we did we could not enjoy the time we are blessed with, short as it may be. I trust we will see our babies again when we pass over the Rainbow Bridge. Think of the lovely reunion we’ll have with all those who have gone before! What a wonderful life you gave Teddy. Know he loved you and treasured your time together as much you have. Everyday you will remember him and honor his life with those memories. Take care, Tina. You are such a good person! We feel you pain as we have been there. Be consoled in the sweet memories and in thanksgiving for all the joys and sorrows our sweet ones have soaked up with us, sensing our every situation in this life. What a blessing you have had. Oh Tina, I am crying reading this sad post. Teddy was a joy to see in your posts. Letting our animals go is one of the hardest things we have to do. So very sad for you and your family. I feel your pain and am sitting here in tears after reading your post about Teddy. Our sweet 16 yr old cockapoo Mocha left us last year and I still look for her. She was 4 lbs. of energy and huge personality. Take comfort that Teddy is no longer suffering and that he had a wonderful life with you and your family. Tears of sadness but also the joy he brought to your family and others. Pets are truly special and family. I am truly sorry. You loved Teddy dearly and he loved you! What a gift! Wishing you comfort at this difficult time! Rest in sweet peace, Teddy. 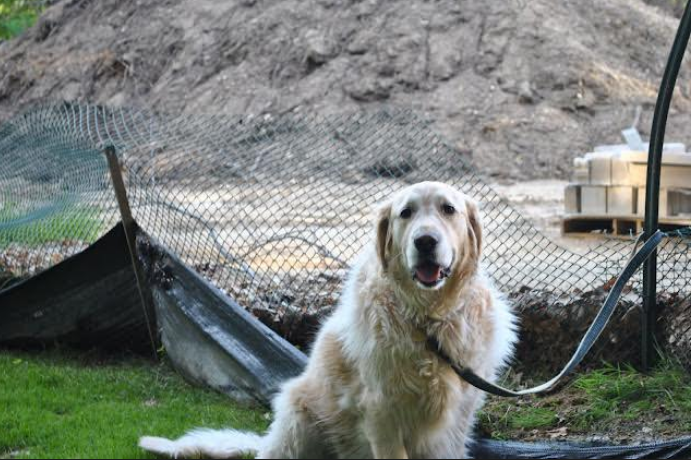 As a Mom of two Goldens my heart breaks for you…I’m so sorry for your loss. God Bless your heavy heart. It is devastating to have a beloved member of your family pass. It may not help now while it is so overwhelming, but I promise you that in time all of the beautiful memories will put a smile on your face. Teddy has crossed the rainbow bridge and is running around with a big smile on his face with his beautiful soulful eyes! We love you Teddy! I’m so sorry to read this. I first found your blog years ago with a post about Teddy. And have always enjoyed that you shared him with us. Keeping you in my thoughts. We grieve just as much or more over our pets as humans. The awful thing is our time is so short with them on earth which is what makes it difficult because we live them so much and time passes so quickly. So beautifully expressed . My Maltese is in the last stages , he is only eleven . I am loving him more and more each day and thank God that I have time to say good bye . My most sincere and deepest sympathy to you and your family . He had a beautiful face and you could see all his glorious . I really do feel for you. We have a 14 year old Border Collie named Katy who is at the end of her life too. Very very sad. I am so sorry about Teddy! Grief is the price we pay for love, and you shared a great love! Tina I am so, so sorry for your loss of Teddy. He was a beautiful friend and will be missed by all of the humans in his life. He and your family will be in my prayers, prayers of comfort to all of you, especially for Teddy to be in doggy heaven and pain free. Tina I am so very sorry for this tremendous loss. And I feel your pain…literally. Last Friday, September 1st, we had to say goodbye to our beloved yellow lab, Buster, 12 1/2 years old, in exactly the same condition as your sweet Teddy. I thought I was doing better, but opening and reading this post just ripped the barely formed scab off a very recent wound and I weep for both of us. I know letting them go as we did was the right decision. Allowing suffering simply is never an option. We gave them wonderful, comfortable lives and in return they gave us only EVERYTHING. 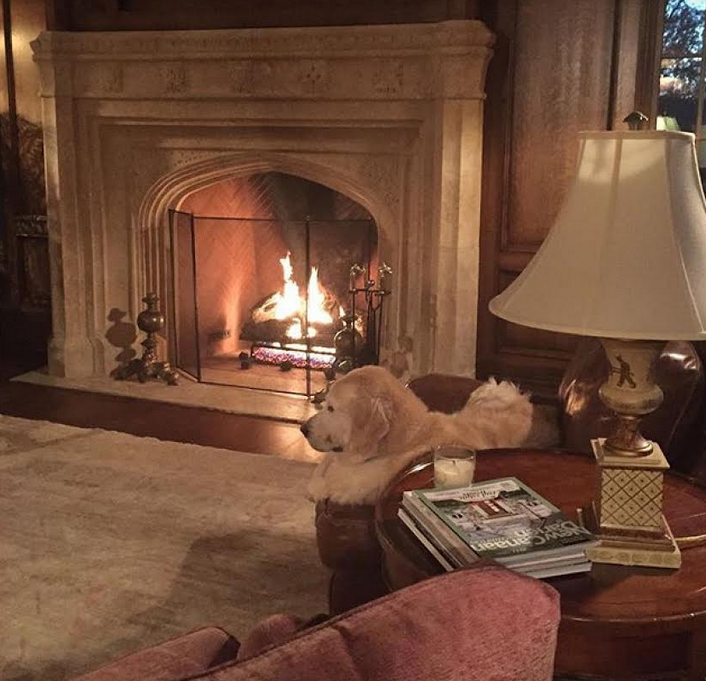 Thank you for sharing Teddy with all of us. I adored every picture and every mention of that precious boy. May God bless and keep you all….until you meet again. I am saying prayers for your family in the days and weeks ahead. Your column today brought me to tears, Tina. Just looking through the images of Teddy in today’s and your previous posts always made me realize that he was more than just an ordinary pet. He was a trusted friend and loving companion. So aware and knowing was he. I feel your loss and offer you my deepest sympathy and condolence. You can rest knowing that you did everything you could for him during his final days. Teddy surely rests peacefully now. My heartfelt sympathy to you and the family. Nothing grabs a heart like a Golden. So truly sorry for your lose. May your wonderful memories of him carry you through this difficult time. We lost our beloved beagle, Sneakers, 13 years ago and a day doesn’t go by that we don’t think of him. They truly are family. My heart is breaking for you please take all the time you need. There are no magic words anyone can say except how blessed you were to have such a special boy in your life. My heart breaks for you…I am so sorry for this tremendous loss of your dear Teddy. I do know how painful this is, having lost 2 Golden’s over the years. Our Brady boy is now 13, missing an eye and slowing down. I too, will treasure every moment with him. My heart breaks for you and your family. Having a 14 year old dog, I know our time is coming soon. Your tribute to Teddy is .just beautiful. you gave him an amazing life and he is smiling down on you right now. Thank you for sharing your beautiful words, and know that Teddy will live in your heart forever. What a beautiful post about your beloved Teddy. There is no doubt that Teddy was loved by all. So sorry for your loss but have comfort that sweet Teddy is now in a better place pain free. Take care ,Tina. I know exactly how you must feel. And yes, you need some time off to grieve, remember and cry. I am all teary myself since I had to put my beloved Murray down after 15 years of joy, companionship and love. So, be well and remember all the good wonderful memories of Teddy. I am so sorry. 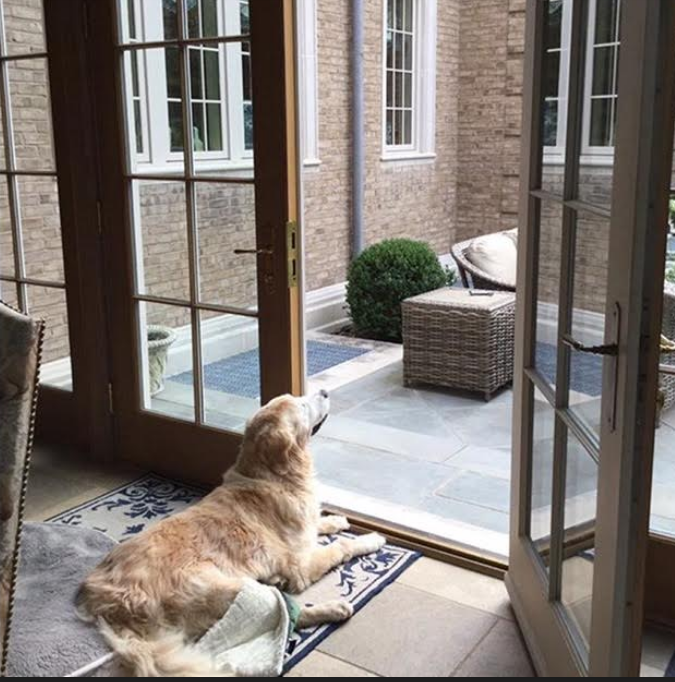 I have loved seeing the photos and, having owned and lost three goldens, know how big a part of the family he was and how hard this is for you. Your beautiful words are better than mine, but it is clear he knew how loved he was. I am so sorry, to lose such a precious pet is so hard. You have honored him with this post, and he was obviously so dearly loved. In the days ahead, may you cherish the many memories of him to comfort you. Tina, I am so sorry to hear about your beloved Teddy. He was a beautiful sweet dog. Many of us know how painful the loss of our furry babies can be. You and your family are in my thoughts and prayers. Sending you big hugs. Your touching tribute to Teddy touched my heart, as a former greyhound owner who had to make the same difficult decision. Pets become much-loved four-legged family members so very quickly, it is difficult to say goodbye. My heart goes out to you in your loss, and I hope that time and another “Teddy” will ease your loss. Thank you so very much for sharing this intimate sorrow of the loss of your precious Teddy. Thank you for loving him & taking care of him for all the years he was with you~ Irreplaceable indeed. Thank you for such an elegant tribute post- with impeccable photos showcasing this tender sweet creature who brought you much joy ~ You are an enchanted woman with an enchanted heart. Tears in my eyes as I read this. Your sweet baby is in Heaven and you will see him again. POO! to all the people who say God did not give souls to animals..,.what God made is precious to Him !! My condolences to your family! Having had to do the very same thing for my beloved Niki, I feel do deeply for you. He was so loved by my family and always tried to please us. He was a wonderful companion, friend, traveler and kisser😍 I would sing to him and he would put his neck back, close his eyes and not move until I finished. His favorite song was JESUS Loves Me. I surely know that he was loved and when he could no longer walk and he looked so tired ,that I told him his brother and sister were waiting to see him and when he needed a lap to sit in that JESUS would let him sit in HIS lap. Crying so hard. Peace be with you. Hang in there- I am sure Puppy Heaven is the most glorious place – such a reward for being such a great companion on earth. I really couldn’t finish reading your post Tina. Memories of our Sadie came flooding back and how I miss her so. I believe it’s the hardest thing to do when it’s time to humanly end our pet’s life. So sorry. Tina, My heartfelt sympathy. Being a dog owner myself, I lost my Cody 11 months ago. The pain is so horrible, but as time goes by you will smile and keep him Alive. They never leave us…. I am so sorry, we had to have our second dog put to sleep and it is just so hard. In all the photos you took of him, I could see he enjoyed being the center of attention. What a love! He was loved by you and your family.. Even though he is gone (too soon, I know) you gave him a wonderful, comfortable and loving life…He was a cherished family member and you have to take time to mourn.. He was a great companion to you & very photogenic. I’m so very sorry for your loss, Tina. Our canine companions are dear family members and best friends, and Teddy will be dearly missed. 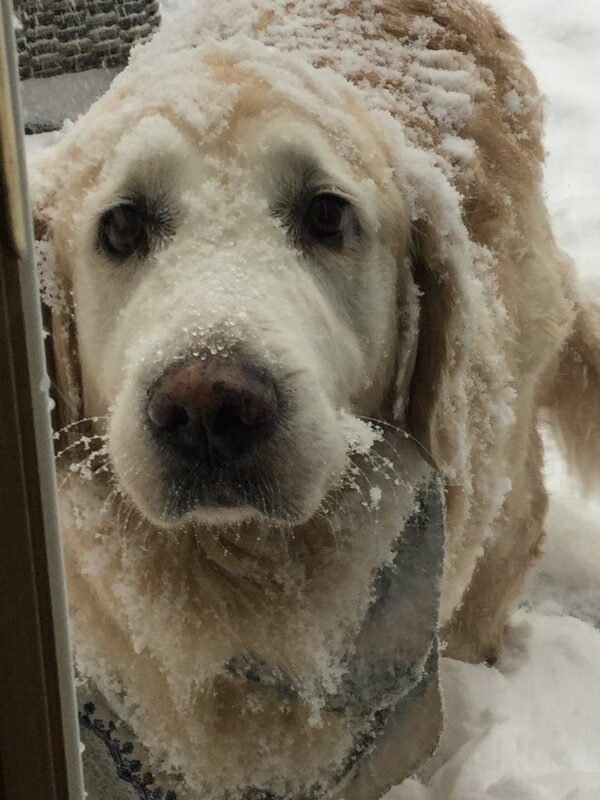 We recently lost our beloved dog, Harley, also a retriever, at age 15. Like Teddy, he had developed arthritis so badly that he could not longer walk without assistance. On May 22, we had to make the heart-wrenching decision to let him go, as the vet said he was in severe distress and nothing more could be done for him. Although I’m still grieving his loss, I also find myself remembering so many happy times we had together. I had to smile when you mentioned that Teddy was your sous chef, as Harley spent countless hours with me in the kitchen, and I talked with him as if he were my assistant! Thanks for giving me (and so many of your blog followers) a chance to know Teddy. Wishing you peace and comfort in the days and weeks ahead. Our pets surely do leave their paw prints on our hearts…so sorry for the loss of your beloved pup. Teddy brought you great joy for many years and you made his life special. What more can a pet ask for. What a lucky dog. I am very sorry for Teddy´s passing. I have had dogs all my life and fully understand how much love we feel. But if it serves of some help now, always always remember that dogs never die….they just sleep in our hearts and wake up whenever we remember them. Tina, I am deeply sorry for your loss. Your announcement has made me weep with sadness. Your post is a lovely tribute to your special friend. What a glorious life you provided for Teddy – may you find some small comfort in knowing that. Thank you for allowing all of us to share in the joy of knowing Teddy through your writings. I will miss him too. It’s so very hard to lose a fur baby. Our first golden, Abbie, we lost to cancer. We found out she had the cancer the day before she died in my arms. She was 11. We now have two goldens, Lexi, 9 yrs. and, Millie, 3 yrs. Lexi is sugar-faced like Teddy. Other than your children’s love, there’s nothing like golden love. Cherish the memories, Tina. I’m so very sorry for your loss. Could almost feel the tears spilling on your keyboard and I’m probably not the only one who is crying along with you. For anyone who has had a pet so treasured, and had to let them go to pet heaven, escaping illness and pain, we send sympathy and understanding. There will never be another Teddy, but there will always be the joyful memories. I didn’t even know Teddy, but he is so cute, it makes me weep. I know how my dog is like my baby and I will someday be devastated without him. So so sorry! My heart is aching for you, I myself lost two much loved Maltese fur babies, my heart was great, but know that he isn’t suffering any longer, and he loved you just as much as you loved him…healing prayers coming your way…. Heartbreaking. Heart wrenching I feel your story and every heartache. I can’t even. . We too shall face this one day with our dog. Just unbearable. My heart goes out to you and your family. My heartfelt prayers and sympathy on the passing of your beloved Teddy I know you will be reunited someday. God bless you and give you strength. Tina, my heart aches for you having gone through the same thing with several of my animals. That giant hole in your heart will never heal completely, for he will always be a part of you. My thoughts and prayers are with you and your family. Very sorry for your loss :(. I am so very sorry for the loss of your precious Teddy. Your blog made him endeared to us as well. Our hearts are broken with yours. So glad he is not suffering anymore but know this is so hard just the same. Wishing you peace and comfort…. 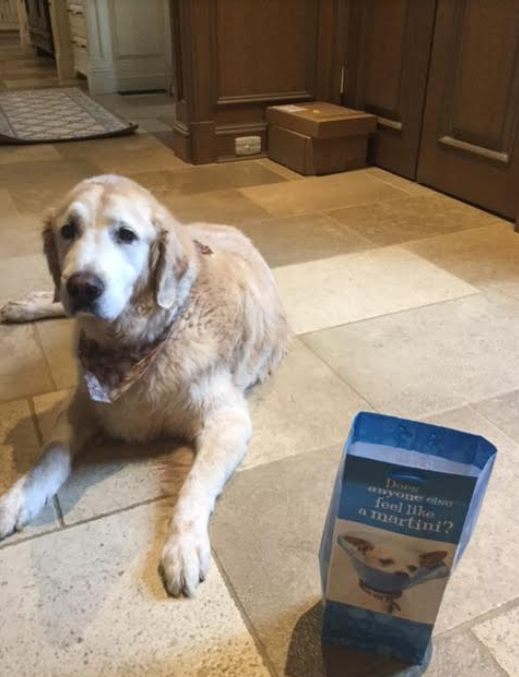 Dear Tina and family, I am so very sorry for your loss of your wonderful dog Teddy, what am amazing tribute you have written for him and shared with all of us, we too are going to miss him greatly, Rest in Peace Teddy, I hope you get to meet my Zoe🐶 Big hugs Tina to you and all your family, you will get through this! I am crying with you. I am sorry for the loss of your dear companion, Teddy. Oh Tina, I am so very sorry and my heart aches for you. Anyone who has had the wonderful luck to have a dog love them, knows the pain you are in. Sweet Teddy will be missed. I liked how he loved posing for his pictures. He was a beautiful model. I hope your heart heals and that you feel the love of so many of us who have come to love your blog and you. I am so sorry that your beautiful Teddy has passed away. This verse comforted me when I was grieving the loss of my dogs. as if I were beside you . . . I enjoy your blogs immensely and couldn’t pass this opportunity to send you my heartfelt sympathy. Sending hugs to you. Treasure those precious memories. They will indeed bring you some comfort! So sorry, I know the feeling. Prayers for you and your family for he was a family member. I’m sure he knew how dearly he was loved. Oh, Tina. I am literally weeping with you. Goldens have the purest hearts in the dog world and the sweetest dispositions. How we are ever worthy of them, I do not know. I had the same moment with my Golden many years (and many dogs) ago when I “knew”, too. All our hearts are with you in the loss of Teddy. My heart goes out to you and your family for you devastating loss. Anyone who follows you can see that Teddy had the best people in the world to love and cherish him. My thoughts and prayers are with you. Our hearts are heavy with you. Through the years of following you daily, you have become a special person to your followers, and we have all grown so attached to Teddy. Please know we are thinking of you during this time. Tight hug to you. With tears streaming down my cheeks, I am aching for your loss of beloved Teddy who I cherished so dearly from afar. 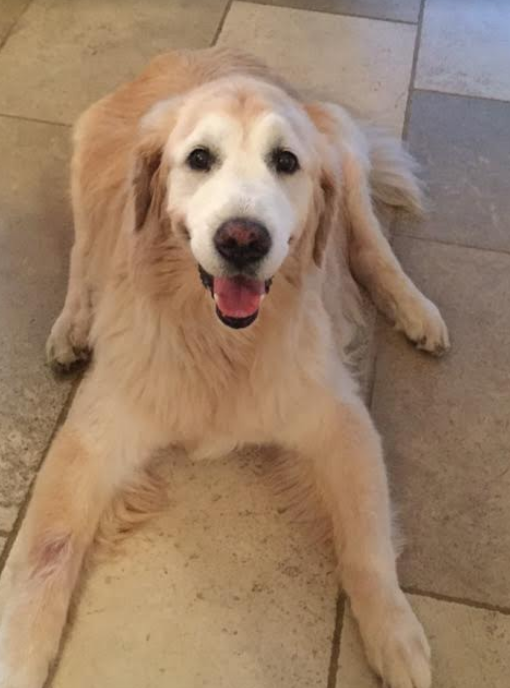 Our golden, whom we lost at 10 1/2 ( you are so blessed to have had 12+ years) looked so much like him and your loving descriptions were also so much our “Sunny”. That is pure Golden, nothing else can compare. The huge hole in your heart will heal, and not one day goes by that we do not remember them. It’s the only way to honor their valuable place in our lives, with loyalty and dignity. You have truly honored Teddy with your beautiful heartfelt good-bye. So very sorry for your loss of Teddy. What a beautiful tribute to him and the love you share. Tina, it’s so evident by all your beautiful postings and pictures of Teddy that he was truly loved. So many of us have had to face this awful decision. However, knowing that I could ease my pet’s pain and save him from horrible suffering and torturous, future treatments gave me and my family so much comfort. I hope you will be comforted knowing that you gave your Teddy the ultimate gift of true love. I often think how kind it would be to be able to comfort humans the same way when there is no hope. Best to you and yours during this sad time. I know the feeling and I’m so sorry for you. Just remember the happy days you shared together! Sincere hugs from Italy. Good bye, Teddy! Thank you for letting us all share in your life. We are grateful for such love. So, so sad. I am so sorry for your loss. I have lost pets too and I know it’s almost unbearable. Hugs from MN! Oh Tina, I am so sorry that you lost your beautiful Teddy. I understand your pain and how much you will miss him. Many of us have lost our precious pooches, and I am sure that many are writing the same thing that I am…that we know your heart is broken. I lost my precious beagle, Penny, several years ago, and I still pine for her…you will too, but knowing that they were in pain, and suffering, even though they try so hard to continue to please us, you did the right thing for Teddy. You had to end his suffering. My heart goes out to you, but do know that I believe you will see him in heaven one day. God could not take such joy away from us when we die. Take care and remember all those lovely and wonderful times you had with Teddy, even though the hole in your heart is heavy. Someone once told me that when we finally go to Heaven, all our pets that have passed will be there to greet us. I truly believe that Buffy, Penney, Rusty, Muffin, Jazzy and Kirsty will all be waiting for me. My dogs knew me better than I knew myself and could always anticipate things I was about to do; and we will always be connected. What a wonderful tribute to your Teddy. You so perfectly summed up what all dog owners/lovers know: “that some friends have to walk on four legs just so they can carry around such a big heart.” So sorry for you loss. Tina, I am so sorry to hear about your beloved Teddy. Speaking as one who has had to let two adored pets go myself, please know that you did the kindest, most loving thing for Teddy. Hold fast to your memories. I will keep you and your family in my prayers. What an unbelievable tribute to a dog that was certainly every bit a member of your family as any human I’m sure. I’m holding back tears, as there shall go I very soon with the impending loss of my little dog Charlie. He is 13 years old and has recently become deaf and is losing his eyesight. I know he’s not long for this world either. Why is it that those we love have to go, leaving us behind to morn? Death is such a hard part of life. He was a lucky dog to have you. Sending warm wishes. I’m so sorry Tina. Thank you for sharing the adventures and photos of your beloved Teddy over the years. My heart is breaking for you as I too know the pain of losing such a devoted and unconditional loving pet. You and your family are in my prayers. My thoughts are with you as you go the beautiful memory’s of your lives together. ( and how lucky you were) to have him as part of your family. My thoughts and prayers are with you. Dear Tina..I am so sorry about Teddy..Dogs bring with them a touch of the ‘Divine..When mine died I felt as if I had lost a piece of the Great ‘Soul..Their passing brings a unique and very deep kind of grief..Teddy’s Spirit still exists and you can honor all of the love and joy that he brought into your life..I am sure that no one could have given a better time on this earth than you did..I will say a prayer for you and for his Soul..
Those of us who have lost a beloved dog in our life know exactly how you feel. It’s never easy. Our family went through it on July 4th of 2015 when we had to say goodbye to our almost fifteen year old Hardy who was a retired racing greyhound and a sweet and loving boy. The following year on August 17th we unexpectedly had to say goodbye to our dear Link who was the clown of our pack of three greys. He had just turned twelve and acted as a therapy dog to our son who suffers from Lyme disease. He was never trained as a therapy dog, but he had a sixth sense when he was around someone who was hurting. We still have our sweet, shy Ransom who just turned ten and welcomed a new addition early in May, another sweet grey named Alfie who is four and a half. You never replace a dog you’ve lost. You just expand your heart and welcome a new canine friend into your life. I have enjoyed seeing your sweet Teddy’s photos and hearing about him. He reminded me of my best friends late Golden Luke who was also a gentle giant. May your dear boy RIP over the Rainbow Bridge and may you be comforted by the wonderful memories you have of him. Tina….I am so sorry about Teddy..Dogs bring with them a touch of the ‘Divine..when mine died I felt as if I had lost a piece of the Great Soul…Their passing brings a unique and very deep kind of grief..You can honor all of the loving gifts that he brought to you..My heart goes out to you and your family at this moment..
Tina….I am so sorry about Teddy..Dogs bring with them a touch of the ‘Divine..when mine died I felt as if I had lost a piece of the Great Soul…Their passing brings a unique and very deep kind of grief..
Tina, I am so so sad for you and your family with the passing of sweet Teddy! 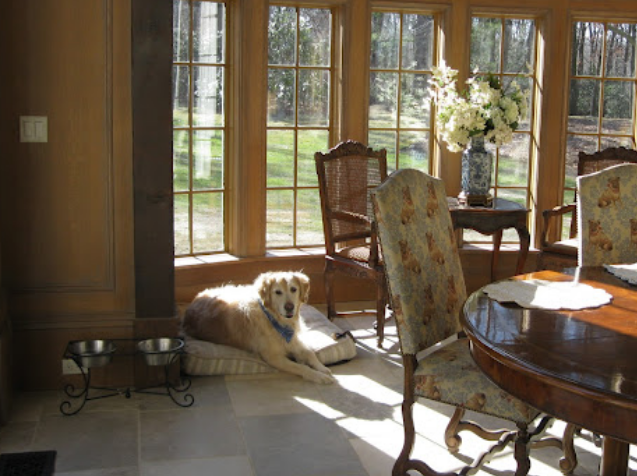 Your post today expresses so well the connection and love we feel for our pets and that they feel for us–I believe this special relationship is truly a gift from God. My family and I have been where you are –it is a heartrending loss–I am grieving and crying with you. Thank you for sharing your life with us and for sharing gentle, loving, Teddy. You all will be in my thoughts and prayers, Tina. God bless you and God bless Mr. Teddy. You know what I love? How all your followers have gathered here to pray for you and Teddy. I’m going miss him, too, because every time he appeared in your post, he made me smile with that precious innocence in his big brown eyes. He may be physically gone, but he lives in your mind and in your heart forever. With deepest sympathy, may Teddy’s memories comfort you at this time, they will help fill that incredible empty space you are feeling. Peace be with you, Tina. You will always be his beloved mommy. What a sweet boy, Hugs! I’ve had many friends over the years that I vaguely remember, but I can remember the names and faces of every dog I’ve ever loved. It just seems so unfair that we have them for so little time on this earth, but I believe that is so we can allow more of them in our hearts. I cry with you at the emptiness in your life and hope someday you’ll allow another 4 legged bundle of love into your home. Oh gosh! I’m so sorry. Your love for that guy was definitely felt in all the posts you have written that included him. I am so very sorry, Tina. My husband and I recently lost our beloved pug, Katie. The sadness is, as yours, immeasurable. Dear Tina, I have had a heavy heart for the last week, sensing this time was coming for you. I am nearing the same decision, and I pray I can do so with such compassion and grace. Your moving tribute and photos were such a gift to all of us. You were a beautiful mom to Teddy ~ and he is free today and in peace. With love, prayers, and thanks to you. Hi Tina. My heart aches reading your post. I was crying the whole time, Please know that I’m keeping you in my prayers and Teddy too. I’m so sorry for your loss. Tina, I am so very sorry to hear about your beloved Teddy…As a pet owner and lover, I know how very hard this is on you and your family…He gave you great pleasure and joy for many years as you did for him…Please accept my deepest sympathy!…..
Oh my God. Tears are streaming down my face. My hubby is asking me what is wrong. I AM SO, SO SORRY FOR YOUR LOSS, Tina. I have known the pain you are experiencing now, and it is excruciating. Please accept my deepest condolences on,the loss of your beloved Teddy. He will be so missed by all of your loyal readers. I am just heartbroken for you. What a beautiful tribute for your most beloved family friend. Sorry for your loss. I’m so sorry for your loss, Tina! It’s so so sad to lose a furry companion and it takes such a long time for that emptiness to leave.. It’s so great you have so many wonderful photos of Teddy. i know you’ll cherish them. There are no words to say for your loss. Dr. Denise has been my vet for over 30 years. All animals are the windows to the soul. In time you will heal and I will say lots of prayers. The hardest part of having an animal is they have to leave us. When I read your blog I couldn’t stop crying. I’ve had animals all my life and there is no home without them. God Bless you. I cannot help but shed a few tears for Teddy. He is part of your blog and will always be so. Since we have been following you, we have fell in love with Teddy also. I always loved to hear about him and see his pictures. My favorite one is the one of him sitting in the back of your husbands red convertible in all his elegance . Please accept our deepest sympathy. I know he was more than a pet he was family. Such a heart felt tribute to that precious Teddy, God knows how they balance and nurture our lives and such a void left. Prayers and strength for you and your family, your post was a marvelous tribute. Have loved and followed your blog for some years and Teddy has been a fixture. Thank you for sharing, as painful as it was. Condolences. We had our dog almost 13 years also when she passed. They are like members of the family. Only dog owners can understand completely. I do. Bless you and your family as you deal with the loss of your sweet companion. I am so sorry for the loss of your beloved Teddy. As I read your blog, tears came to my eyes as we, too, had to say goodbye to our Midnight, who was so precious to us about six years ago. As they say, time makes the sorrow better, but there is always a void in one’s life after losing a pet. Pets are truly a member of the family. Be good to yourself and remember the wonderful times you had with him. We have a special place in our yard where we honor Midnight. In your beautiful yard, may you find a special place, too. It helps ease the pain of our loss. Take time to grieve. It is so important. Over the years, you have shared Teddy in your many posts. Thank you for being so kind; prayers to you and your family. So sorry for your loss! Just talking to someone earlier today about how hard it is to loose a pet. You will be in my thoughts and prayers. What a blessing he was from above! I’m in tears reading your tribute. So sorry for your loss. I have a 11 yr old golden and he is special to me as was your Teddy. They are family and it is a great loss. So very sorry… the pain we feel when losing a beloved pet is beyond words. You did the right thing… he was just as lucky to have you for his family. Tina, may our God place his loving arms around you & your family. May you have peace & the happiest thoughts & memories of your baby. What a heartbreak, what a sweet, gentle soul, I am so sorry he had to go but glad he was so fiercely loved and surrounded by those he loved back., I know you’ll miss him forever but your memories will keep him alive as long as you are.. So sorry for the loss of your beloved family member Teddy. Your post was a lovely tribute. So sorry for your loss, Tina & family. We too, have had to make that unthinkable decision with our beloved Westie, Hamish, when he developed pulmonary fibrosis at just 6 years old. His memory lives on and we now have two Westie girls, age 9 & 12. Hopefully they will fill our lives with joy for a few more years yet. Such sorrow in life to have to endure pain of loosing someone you love. I hope time and the beautiful memories will help you heal. Glad that Teddy is no longer in pain and prancing around in heaven with all his friends. I don’t know how you made it through your post. Your beloved Teddy! I cried along with you and send you a huge hug and from another Dog Mom want you to know, Teddy is well cared for in Heaven and will always be with you. Thank you for sharing your beloved Teddy with us and may all the love and support you receive help sustain you in such a sad time for you and your family. Tina, You and your family have my very deepest sympathy. Losing a beloved pet is so painful. Teddy was a beautiful dog and I, like many of your readers, loved seeing pictures of him. I am very sorry for your loss. So sorry for your loss! I know that he was a part of your family and very much loved. I am so very sorry for your loss. I just adored your sweet and beautiful dog Teddy, since the very first day I started to read your blog. All these miles away across the pond I felt like I knew him. His lovely face and sweet personality just shone through and I hope you will be comforted by how much Teddy was loved all around the world , my dear friend. He reminded me of our childhood Labrador Honey, I adored her. I follow your instagram and I had sensed these last days that Teddys health was worsening, I was so upset and sad Tina. I have cried so much since knowing he passed away and you are incredibly brave to post this beautiful tribute today, which truly honours how special Teddy was. I know that Teddy had a wonderful life with you and your family, you have loved him with your whole hearts, and he will always be remembered. Every time you showed a picture,it made my day I just wanted to hug him. So sorry for your loss. I loved his sweet white face. I am truly sorry for your loss. My heart goes out to you. May you have peace of mind knowing Teddy is no longer suffering and smile with joy every time you think of him. Oh Tina, my heart aches for you. We lost our sweet little rescue dog on Monday from cancer. I know how hard it is to watch them suffer. I have cried all week. Reading your post made me sob. Teddy was a treasure….Hang in there. I am so very sorry for your loss. Dogs are a member of your family, and the loss hurts deeply. We lost our sweet Scottie , Rosie of 14years last August. She too suffered from arthritis in her back. She and Teddy are no longer suffering in doggie heaven. Tina, so sorry for your loss. You did the right thing putting him down. That is our gift to our pets, to not let them suffer. Pets are part of the family for sure. He was a beautiful dog. My best. I have never responded to any of you post. . I too am an animal lover, and am in tears. I have been concerned about Teddy’s aging and worrying about how you were going to bear his passing. Took us a year to adopt a new dog, as we were overwhelmed with grief when our last dog-Holly passed away in my arms. Our precious-wonderful-brilliant vet told me the day we decided to let her go: “This dog has given you so many gifts, this is the last gift you can give her.” I will never forget her compassion. My mother used to say: There is not love like a mother’s love”. I would like to add: “There in no love like the love of a dog.” Never thought I could love another animal as much as I loved Holly, (or all our other dogs), but we have a new love with “Skeeter” (named after main character from movie “The Help”). May God bless you and your family now in your time of grief, and in the future with the unconditional love another “lucky dog””! Dear Tina and Family, My thoughts and prayers are with you at this most difficult time. I cried the entire time reading your post, as I like many consider Teddy “family.” It is so hard to lose a member of your family. We lost our King Charles Cavaliar Brandi four years ago and I still can’t bear the thought of another dog. One month after we lost her my Mom died. Not a day goes by without thinking of them both and the many wonderful memories they both provided. May Teddy know the comfort of heaven and you and your family the love, thoughts and prayers of your extended family who all have come to regard Teddy as family. With love, prayers and condolences Judy T.
It is unbelievably hard to say goodbye to our four legged family members ❤️. I wish you wonderful memories and God’s peace. I am so sorry to hear about precious Teddy! I looked for him in your photos and thought he was just adorable and sweet and loving. I know you are missing him terribly but he will wait for you at the Rainbow Bridge. Just so very sad for you. Teddy was such a beautiful guy and your baby. One lucky guy to be loved by you and to love you for 13 years. Been there many times. My daughter just evacuated from Florida with her Family and new puppy. She also took along the urn from her dog who passed away 6 months ago. She sad she could just not leave him behind. Dear Tina: This post just cuts me to the bone. I feel so sorry for your loss and totally understand this as I too have experienced it. Please know that even though we are only “blog” friends I am sending you much strength, love, and prayers. RIP sweet Teddy, we all loved you too……. Oh my! Of course I tell myself crying for the loss of a dog I only knew through a blog is silly, but here I sit crying as I read your post. My sincerest sympathies for the loss of your precious Teddy. May you have peace through beautiful memories. Oh, Tina, I am so sorry for your loss. It is the hardest and most distressing thing to see our beloved companions decline and suffer. We have the difficulty of not wanting them to suffer but also not finishing their life too soon when they are still getting pleasure out of living. The one last gift that we can give is to be wrapping them in our loving arms and holding them to our hearts as they leave this world gently. The bereftness that we feel is the price that we feel for our deep love, though it hurts so much. He had such a wonderful life as part of your lovely family. Thinking of you and your family. R.I.P. Teddy. Like everyone else I also am crying because we have all been there.. so so painful ..thinking of you! Tina I know you are heartbroken. Our fur babies take a piece of our hearts with them. A house just isn’t a home without our sweet loving fur babies. My little girl Bell went to Rainbow Bridge last Sept, there isn’t a day I don’t shed tears for her. Coming home was just heartbreaking knowing she wasn’t here to share my life. You will not get back to normal in a few days, and that is ok! Teddy was a friend to all of your friends and I am stopped in my tracks as I lost my golden, my beloved Pheona one year ago next Tuesday. Teddy, I hope always stays as a symbol to your ideas and I think we need need wrapping paper in Teddy’s memory. 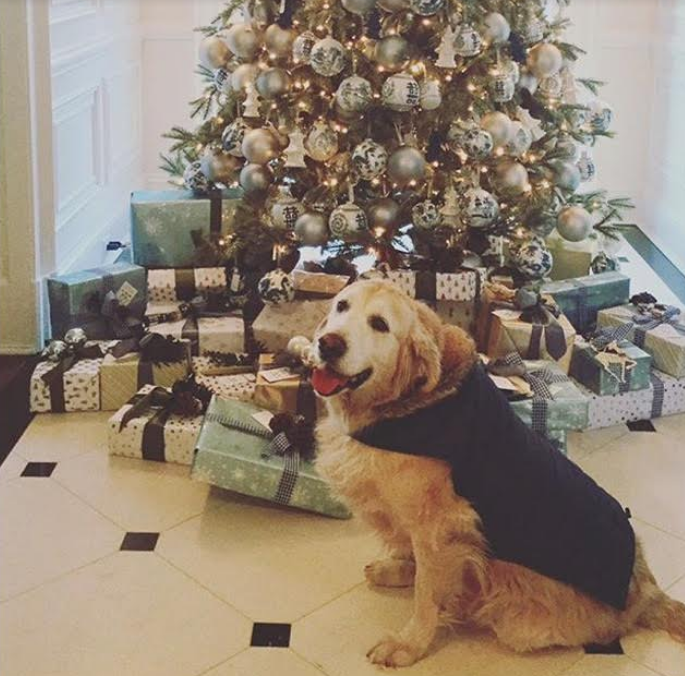 Golden’s under the tree ! I know the pain of the decision and how one’s heart physically hurts at the lost of a four legged love one. Please know you are not alone and that others weep for the loss of a beautiful boy who smiled his way into our hearts more than you know. Tina – I feel your pain. We had to put our yellow lab down 5 years ago. Not a day goes by I don’t think of her. They seriously love like no other. The house was so empty after. The silence when I opened the door and no one came running. A month after we lost her I saw a quote somewhere. Honor my memory by saving another! I took it as a sign. We now have Maya a black lab & Great Dane mix. She’s not my tala, but I love her as much, which I never thought was possible. I hope you find happiness again. I’m your age and everyone thought we were crazy to get a puppy (me too a few days!) but oh how she mended our hearts. I love how much you loved teddy! I love him on the furniture! I hope the memories remind you how lucky you were to have him and he you. Dogs are amazing. I am so sorry. I am so sorry for the loss of your beautiful, beloved Teddy. You have so many wonderful memories to cherish. I’m so glad he isn’t suffering anymore. God bless him! I am so very sorry. may God’s peace be with your sweet spirit and in time heal your tender broken heart. I don’t always leave a comment but just had to today. I am SO SORRY for your loss. Teddy was such a sweet, beautiful dog. The picture of him on the rug, looking out the door made me cry. We had our dog for 17 1/2 years and when she left us it was almost unbearable. RIP, Teddy!!!! I am so terribly sorry for the loss of your beloved Teddy. 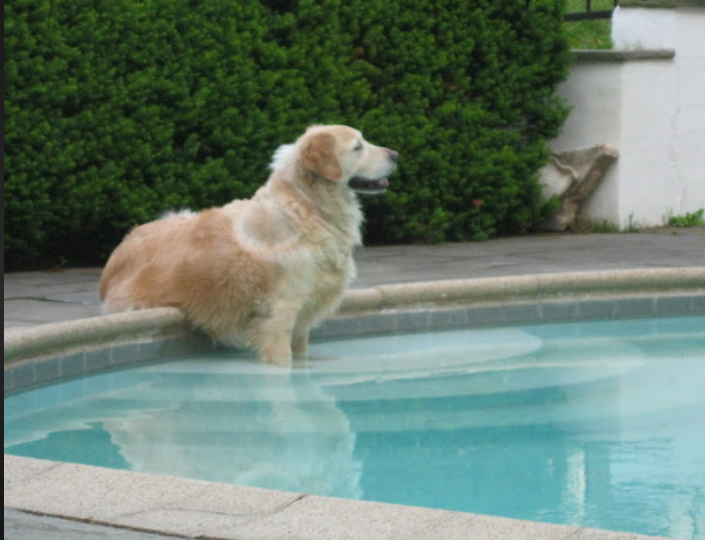 I am on my 5th and 6th Golden Retrievers – I always have two and when I lose one I get another. I have found that after a period of mourning (I let my heart tell me when it is time) a new puppy (or even once adopting a 7 year old from my breeder) is the only thing that begins to fill my heart again and stop me from crying uncontrollably every day. All dogs are beautiful creatures but I think there is something particularly special about a Golden. I am certain you and your family gave him a pretty wonderful life, and you loved him enough to not let him continue to suffer despite how stoic they try to be in the end. I so wish dogs could live longer lives like humans but they are not mean to be here forever but to touch our souls for a brief moment in time. For that, we are fortunate. I am so sorry for your loss. An angel for sure. Glad he’s no longer suffering. You will see him again. They come back you know. What a beautiful tribute to your Teddy. They truly are apart of our family, may the beautiful memories carry you through the difficult times. This news is so sad. I’m very sorry for your tremendous loss of your beloved Teddy. My Angus will be 14 in October and does have medical issues. I dread the day I’m in your shoes. I first started reading you blog years ago when something happened to Teddy. Can’t remember what it was but that’s been many years ago. Your loss will last a long time, your grief will be with you but Teddy is in your heart and always will be. BELIEVE ! We have to Believe! I am so incredibly sorry for your loss. It is one of the hardest things we ever have to do, but one of the best gifts we can give to our beloved pets when they need us the most. He is now in heaven and I’m sure my fur babies are playing with him and sharing their goobers (treats) with him. Hugs to you and the family. Tina, I am so very sorry. I feel like I too have lost a friend. your post is the first one I read every day and I loved the ones that included Teddy. My tears are flowing. As always. Love to Teddy. I am so sorry for your loss. I loved the beautiful pictures you shared of Teddy! He was a beautiful boy. How very sad I am to read this. Teddy was such a lovely presence on your blog.I always looked forward to seeing his beautiful face. It it obvious that he had a wonderful life with you, he looked so happy. I am in tears for the loss of your beloved Teddy. It truly is the loss of a family member. Take joy in the memories you made with him and know that he had the best of homes and was loved. I think that is all our four legged friends want – to be loved. They unconditionally love us and want so little in return. I always loved seeing Teddy in your posts and will miss seeing his fluffy face. Hugs to you. Prayers and hugs from Waco, TX:) Crying as I read this beautifully written post and reflect on our furbabies that have taken a little part of my heart with them to the Rainbow Bridge. Oh Tina, my heart aches for you. I am deeply sorry for your loss. We have 5 fur babies right now. Ages 16, 10, 4, 3, and 2. They are such a large part of our family, as Teddy was to yours. Prayers for you. Oh….this is so very sad. I have felt your pain! Tears are streaming down my face as I read about Teddy. I lost my precious lab Mac a few years ago. He was 14. Not a day goes by that I don’t think about him and miss him. Maybe he and Teddy can get together at the Rainbow Bridge. So sorry. I am so sorry for your loss of your beloved Teddy. 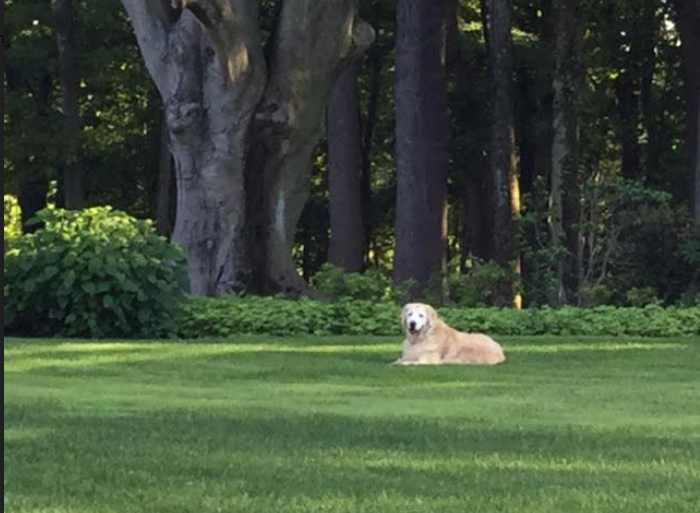 I’m writing this as I sit here in a hotel with my 11 1/2 year old yellow lab, Duffy. We evacuated from Jupiter FL. because of hurricane Irma. I know how difficult it is to lose a dog.. I love all of his photos. Teddy was beautiful dog. God bless you & keep his memories alive. You have done the most loving and compassionate thing for Teddy. Grief is the price we pay for loving mortal beings. I am praying for you and everyone who loved Teddy. God bless your beautiful Teddy. A wonderful family companion. He did his doggy duties with pride and set the bar for all that a family dog should be. My sorrow to you Tina and your family. I will miss pictures of him and the love you so beautifully showed him. From Marvin, a Teddy fan. I am so sorry for your loss. I loved hearing about Teddy. Through your posts I know he was loved. He had a wonderful home ,yard and family. You all are in my prayers. So sorry! I always loved seeing pictures of Teddy as a treasured member of your family. He was loved well during his life, and I know he was a blessing to you! Tina, I’m so sorry you lost your beautiful Teddy. What a heartbreaking day. Dear Tina, I cry for you, for Teddy, for all your family. Your loss is so tremendous, but your love & memories will sustain you. I went through a similar loss during my divorce of my precious little JRT, Sissy, who had been chosen one of 10 HGTV’s Most Pampered pets. Then last spring I lost my little Shih Tzu, Rosie unexpectedly. My grief has lasted so long that I’m still not ready for another love. Many prayers & hugs for you, Teddy’s most loving mother. Oh dear Tina…my heart aches for you. Having loved and lost several retrievers myself, I do know how heart breaking it is to say goodbye. 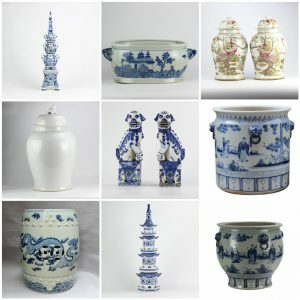 I think everytime we have put one down (all due to arthritis) a little piece of me and my husband dies also. You can rest assured Teddy is having the time of his life and his spirit will always be with. Many prayers for you and family for God’s healing grace. SO VERY SORRY FOR THE LOSS OF YOUR SWEET TEDDY. THEY ARE THE TRUEST OF COMPANIONS BECAUSE THEIR AFFECTION FOR THE FAMILY IS ALWAYS UNCONDITIONAL. As soon as I saw your post I started to cry . Your Teddy was beautiful . My heart goes out to you at this saddest time , Teddy had a wonderful life and was lucky to have you for his mummy. Cried through the entire post. So sorry to hear about Teddy. I’m so so sorry to hear about Teddy. Over the years, I’ve lost 4 Goldens of my own and 5 others of my familie’s. They are incredibly wonderful souls and loosing them is unbearably hard. Cherish your memories of Teddy and think about a new little friend in time. Baby Henry, 5 months old, is a true joy to me and a tribute to the wonderful Goldens that shared my life before him. Hello Tina. So sorry to hear of Teddys passing. I emailed you a few years back to thank you for your lovely blog lifting my spirits at a devastating time after the loss of my beloved golden Jack and my husbands diagnosis. You were very kind in your communications to me which I was very grateful for. I will miss Teddy terribly as he has kept my Jack alive as they were virtually identical. (My husband often assumed I was looking at photos of Jack as I saved quite a lot of the images you posted) It almost felt like my Jack continued to live this lovely life with you. So very sorry about your sweet Teddy. He had a wonderful life with lots of love. We lost our 12 yr old shepherd Hazel last year and our hearts are broken, but recent rescue Henry helps. Thank you for sharing Teddy with us; you will see him again one day. 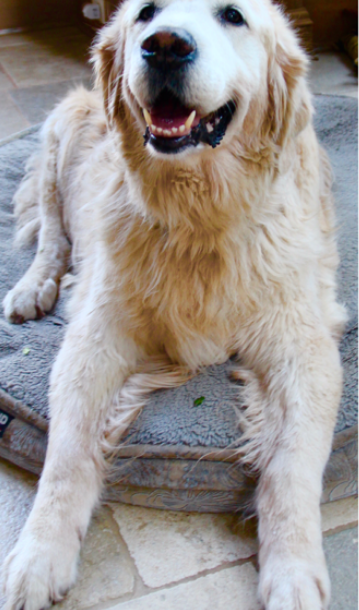 Just a beautiful story about a beautiful friend….I have Lilly the Golden Girl and she is ten. Cherish each and everyday with her. Sending prayers to you. Such beautiful words dedicated to Teddy. It made me cry as I know how dear he was to you. Having gone through the same experience with our own beloved dog, I understand your aching heart. You deserve to take some time to mourn. Our pets are our children too. Thoughts and prayers for you. So very, very sorry for your loss Tina. OH dear Tina….I didn’t want to read this…..my heart is so broken for you all….beautiful Teddy….I have followed you and loved Teddy for some time now….our golden, Tucker lived until 12 years old, so we know all too well, the sadness and grief you are feeling…may God bless you and keep Teddy close to him forever more. Dearest Tina, I feel your heartbreak as our family lost our first baby Tucker, a yorkie, almost two years ago. The hardest part was seeing his little corner of the kitchen with all his things and the absence of his presence all around our home. I have enjoyed reading your blog since I discovered it and especially enjoyed all the posts and pictures with Teddy. You and your family are in my heart and prayers during this difficult time. I know it hurts but the wonderful memories and love you shared with Teddy will be a comfort to you. Sending you a big hug from Ohio. My heart aches for your loss. Oh, Tina, tears poured down my face as I read your post about Teddy. 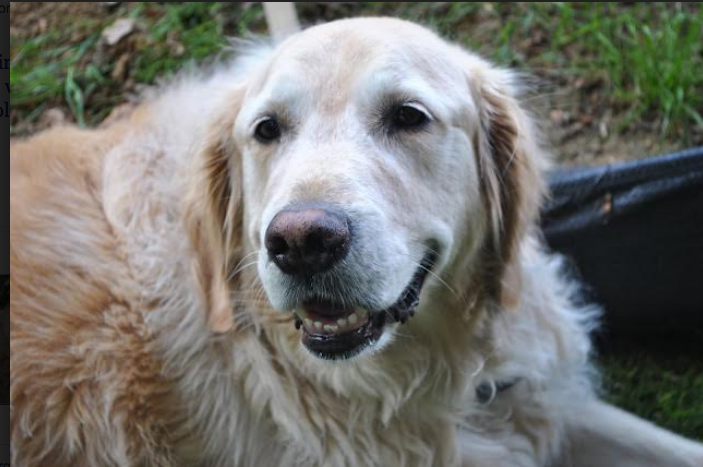 I know the loss (twice) of a sweet Golden and it is absolutely heart breaking. Teddy was such a good boy, and I always loved when he was included in one of your posts. You gave him such a wonderful life and he gave you his best in return. He held on and waited for you to get back from your destination wedding trip, and I am so glad you were there for him at the end. Godspeed, Teddy, as you cross the Rainbow Bridge. As I write this with tears in my eyes, I must tell you that was the most beautiful post/tribute to Teddy. Sadly, I have been in your shoes. But you are so right when you say you wouldn’t trade having him in your life, just to spare the grief. Having a beloved pet as a member of your family is a cherished part of life. As I always said “hugs to Teddy”, please know I am sending a “big hug” from my family to yours. I am so sorry for your loss. Losing a pet(doesn’t even seem like the right word), a friend is so very hard. I have been where you are four times in my life. I wish we never had to face it, but to love is to have our hearts broken. He will be with you forever. My deepest sympathy, Tina. Reading your post brought tears to my eyes and renewed memories of my own dear Border Collie, Shasha. I found her while visiting my M-I-L ‘s home in the Pocono mountains. She too was eight weeks old and we immediately became soulmates. She lived 17 years and I also struggled as you did with her deterioration and could never make the decision to say today, this is it. I just couldn’t do it as long as she was able to eat and drink and live a pretty pain-free life, She also suffered from dementia which broke my heart because, in the end, she didn’t recognize me as she used to. Enough about me, however, my point is of course that one day when I cross over to meet our Lord, Sasha will be with him waiting for me and I know Teddy will be there for you too. I also have asked to have her ashes buried with me. Stay strong, memories help. So very sorry for the loss of Teddy. Of all the lovely posts you have done over the years the best, to me, were the ones that included something about Teddy. I too have experienced the loss of 3 labs over the years. It is a huge blow to everyone and it does take a while to recover from it. They are our family members and we grieve for them…as we should. As a reader from Texas thanks for what you are doing for contributing to those affected by Harvey. Oh Tina like everyone else, I am crying like a baby and wish I could reach through the computer to give you a hug. As a fellow dog lover and one who has lost two goldens, one at only 6, I know your pain. It feels like it will never go away but it does, not completely but gradually you will feel and see the pain start to fade and it will be replaced by your ability to recall special memories of Teddy that will make you smile and laugh. Keep pictures of him close to your heart and always remember how lucky you BOTH were to have each other for so long. Dogs come into our lives to show us the meaning of unconditional love, both to receive and give it. I am sure Teddy helped to make you the person that you are. I know he is, as you said up there running freely, happy and carefree and telling all of his new friends about the great life you gave him. Your pictures of him are simply beautiful and treasures of the life you shared. Prayers and my best wishes to you and your family. Having been I your shoes more than three times, my heart aches for you. May God bless you and your family as you heal from this tremendous lose. Having been in your shoes more three times, my heart aches for you. May God bless you and your family as you heal from this tremendous lose. It’s the hardest and saddest thing ever. I’m so sorry, for your loss of Teddy. I have a 16 year old who is my soul mate…..I’m walking down that path. My sincerest condolences. So very sorry, Tina. I have always followed your blog so have also followed Teddy! I remember all the great dogs in my life decades later. They bring such love and joy. You were a great friend to a sweet companion – so lovely to have a wonderful pet in one’s life! Pray you take peace in all of this and heal from the blow while holding on to all those great memories! Tina, my heart goes out to you and your family on the loss of your beloved Teddy. So many of us understand your pain ( I lost my darling Cosmo just over a year ago.) It may take time, but you will heal. You did the right thing, as hard as it is, by helping Teddy be free from his pain. As you said, you could read his wishes in his eyes and you are a better person by putting his comfort in front of your needs to have him with you. Prayers for all of you in this difficult time ahead. So very sorry to hear of Teddy’s passing! They pack in a lot of love in the short time that they’re here with us. May the many wonderful memories you have of him comfort you & your family until you see him again. I am so very sorry about your loss. I lost my fur baby last year, and it has been so hard to get over. I wish you peace in the coming days with wonderful memories to cherish (that you have). We all loved Teddy. So very sorry for your loss. Tears are streaming down my cheeks reading your words. My heart aches for you and your family. I am so sorry to read your post. Your posts on Teddy were always my favorites. How blessed we are to have them and how very hard it is to be without them. You and Teddy are in my thoughts. He will be missed. Thank you for sharing him. I am so very sorry for your loss. My husband and I lost our dog , Teefy of 17 years a beautiful standard poodle in July. I do understand the pain and heartbreak you’re going through. And even though I don’t know you I wish I could reach out and give you a big hug. Teddy was one beautiful dog and a beautiful soul . I know Teddy and Teefy are running through the pastures and woods of heaven without any pain. Be good to yourself these next few months the heartbreak comes in waves . I read about your loss on Splendarosa and thought to come over and drop a line. Teddy is a wonderful soul and he did his best by you and you by him. I’m sorry for your great loss but the happiness that comes with being best buddies for 13 years is the part to remember. What a wonderful friendship! I am so sorry for the loss of your beautiful Teddy. I am sure he is chasing butterflies in doggie heaven without a care or pain in the world. I will miss him too. Makes tears come. We have experienced the same pain a few times and our furry friends are so much a part of our life. Take heart. I just got through the times by thinking their pain was gone and they were at rest at last. So sorry for your loss. So many of us know that pain of losing our furry companions. I’ve loved seeing and hearing about Teddy in your posts — he seemed like such a gentle soul. What a blessing you were to Teddy and he to you; he loved you well! Aren’t pets so very precious. Sorry for your grief. I am heartbroken for you and your family and there are no words to express how sad I am for you. Teddy had a wonderful family who loved and took such wonderful care of him. Please know you are all in our thoughts and prayers. So sorry about your loss of Teddy. I always looked for him in your posts. Beloved pets are a piece of your heart. So so sorry for your loss. Unless you have a family pet you can’t understand! I was very moved by your TEDDY TESTIMONY…my SANDY was 13 as well… Sandy (like Teddy) had that unconditional love… and when all else failed in my household Sandy and I went for a walk …like Teddy… my Sandy got terrible arthritis … but she would still manage to go and visit her buddies in our neighborhood… one day my friend found my Sandy upstairs in her home waiting for her buddy… There is a friend of ours who is crippled and we all brought our dogs to celebrate her birthday. At dog beach…..( only by then my Sandy was in a beautiful wood box)….she still made it to the birthday party and she is still with me…,listening to me lament and still understanding…. I am just heart broken for you and the pain that I know you are feeling. 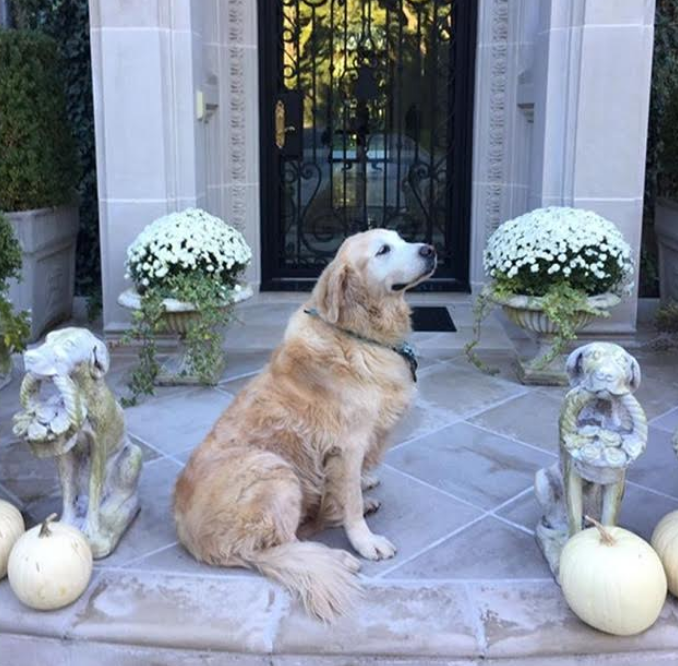 I too have a golden that I love so much, and I always enjoyed every picture and story that you shared with us about Teddy. I just loved him and I pray for you as face each day without him. You were a wonderful Mom to him and I thank you for giving us the experience of loving him also..
Teddy was so special and my heart just breaks for you. I am so, so sorry. Thank you for sharing him with us all these years. Tina, when I read the title of your post, my heart sunk. I am so sorry for your loss of sweet Teddy. I understand how difficult and utterly heartbreaking it is to loose a beloved 4 legged family member. My thoughts are with you and your family. May your memories of Teddy bring you some peace and comfort. I never met him but I loved him, too. He was. gentle giant with a soul. A lifetime friend, who will be in your thoughts the rest of your life time. I’m sorry, Tina. I already had to say goodbye to my beautiful beethoven who had kidney failure. There is no more unjust pain, theirs, beings that are pure love, and ours that we must say goodbye to wonderful creatures. But life really does follow, and a year after losing my eternal friend, I found an abandoned puppy on the street, and even if I swore I did not want to go through that again, I ended up bringing it with me. Never one love replaces another, but gradually the heart of one who once knew this level of love ends up being forced to love again. After all, is there greater love than two strange creatures who share the same look and understand each other? The pain will subside in the certainty that you have made the right decision; free him from pain. Strength to you and your family. Your loss of Teddy reminds me of the my own loss of Kandee who was a black Labrador and Golden Retreiver mix. My heart is still broken. I know how much you will miss him. I am so very sorry for your loss of Teddy, and the inevitable grief and longing that goes with missing the presence of one we cherish. You will be in my prayers. Tina, as a reader of your blog from the beginning, I have loved reading and watching the adventures of Teddy. While reading your post, I am weeping as if Teddy was my own. He was such a special dog. So very sorry for your loss. What a beautiful tribute to Teddy. He sounds like a remarkable companion and friend. My boxer, Jack, was a rescue and he had been injured pretty badly before we adopted him. His arthritis is really troubling him and sometimes, I like you, have to pull his rug to the door so I can help him to go out. Soon, unless God intervenes, I will have to make to decision to set him free from his pain. I will say a prayer for you and your family as you mourn the loss of Teddy. Oh I knew where this was going as soon as I saw his face. Oh Tina, my heart aches. Beautiful post. Tears. My golden boy is 9. Loved and adored. Hugs to you. I am so terribly sorry, Tina. I will miss hearing about Teddy and seeing his cheerful face in your posts. I know it is hard to lose a four legged family member. I am sure several of us have gone through it. You always miss them. It does not lessen through the years. I still miss my dog Marley so much. You gave Teddy a great life. And you unselfishly ended his suffering. I know he is grateful. As soon as I saw Teddy’s face, I knew the unthinkable had happened. I read the entire post crying and I am still crying. Words can’t express my grief and feelings of sorrow at Teddy’s passing. You could just tell from his sweet face what a big sugar bear he was. I also have a 13 year old dog, who is grey around her nose and has to be lifted onto our bed at night. Our dogs are a very big part of the family and give us such unconditional love, it will be difficult for you not to see Teddy’s face in those old familiar places. You are so fortunate to have such great photos and memories of a much loved pet. My heart is full of sadness at Teddy’s passing but you gave him great comfort and peace holding him, while he passed on. Much love to you and your husband and may your heart be filled with the love Teddy gave to you to sustain you through this difficult time. Oh no, Tina, I am crying right with you. I am heartbroken for you and your family. It must be so difficult and painful. But he is out of pain and is now healthy and chasing balls and jumping high in the sky again. He is free from his pain. For that, we can all be so grateful. The first picture you showed of Teddy was incredible. His eyes show the depth of his love for you. The second picture of him just shows Teddy taking life in and how much he really appreciated life and really enjoyed every minute of it. For that, you should feel so good because you gave him an extraordinary life of love, care, appreciation and family. He led a very happy life because of you Tina. You should take great solace in that. I am in tears reading about the passing of your sweet and beautiful Teddy. It was apparent how much love he received and also gave back to your family. Thank you for sharing him with us over the years. I am so sorry for the loss of your beloved Teddy. 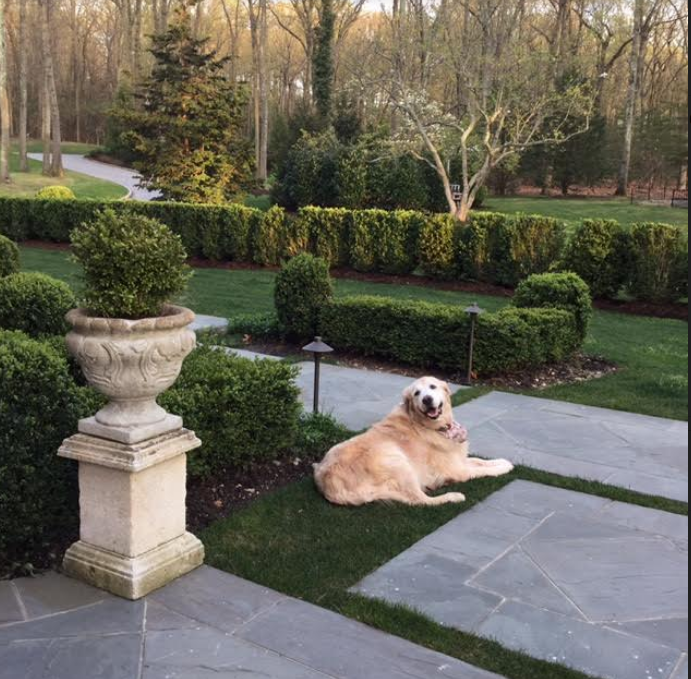 We lost our darling Della last year – a 15 year old beautiful yellow lab – and your post touched me deeply. Our Della suffered the same arthritis as Teddy and we too had to finally make the hard decision to put her to sleep. Teddy looks like a wonderful boy and Della would have loved him. I still miss her but, like you, I know it was the right thing to do. You have my deepest sympathies and I hope you can dream happy dreams about Teddy soon. So sorry Tina for the loss of Teddy. Enjoyed the photos of him over the years I’ve been following you. Coincidently or not, we are expecting a grandson in a few days and his name will be Teddy (Theodore). Wishing you peace and comfort. I am so so sorry for the terribly sad loss of your precious Teddy! He was a beautiful and loyal companion. May you all find comfort knowing he is no longer suffering. Your tribute and photos were heart-wrenching, but showed what a wonderful life he had. My best to you as you grieve the loss of Teddy. Tina, I have thought of you often this weekend. I hope you are feeling better. As almost anyone on earth, I have felt the pain of losing a beloved pet. What is it about them? They grab onto us like nothing else. Teddy did this to many of us. He was special. To your credit you and your family have a great deal to do with that. It’s not unlike bringing up a child. Take care. My love for Teddy continues …. Dear Tina, I am so very sorry. I had a feeling this post would be coming in the not to distant future from comments you’ve made in recent posts. I’ve been crying for you and your family as I read your beautiful tribute to Teddy. He was a very special dog and I know your heart is breaking. We will all miss him and the stories and pictures about him. I’ve never read such a loving tribute and it has really touched my heart. Of course it brings back difficult memories of having to say good by to all of our own beloved dogs. Your wonderful pictures of Teddy have reminded me to take more of our wonderful (current) Standard Poodle” Chase”. Wishing you strength in the days ahead and know we are all thinking of you and praying for you. My heart breaks for you, as I write with tears in my eyes! Teddy is a handsome boy and I always looked forward to your posts that included this special boy! You and your family are in my thoughts and prayers. May fond memories sustain you during this difficult time. All of us, who have lost our dear fur babies share your loss and feel your pain. Truly, tears in my eys, I am so very sorry that Teddy is gone. I have enjoyed seeing his smiling face and hearing what he was up to, knowing that he was your treasured companion. I know how much you love Fall, so I can only help that as we transition into your favorite season that you will be comforted with the knowledge that Teddy is no longer in pain and that he had a WONDERFUL life with you and your family. I am so sorry about Teddy’s passing. I do know exactly what you are going through and how very sad you feel. Tina, your beautiful tribute to sweet Teddy has moved me to tears. I love your blog and always looked forward to seeing Teddy and what he was up to! I loved how he smiled for pictures and posed for the camera. It was obvious he loved his family and his life. What a lucky lady to have had Teddy and what a lucky Teddy to have you! Tina: I am behind on my emails due to Hurricane Harvey and just read this post. I broke down and was sobbing reading your beautiful tribute to Teddy. My heart breaks for you and I understand so intimately every sentence you wrote. Our dear yellow lab Star left us 5 years ago for the Rainbow Bridge and I miss her every day. When my mother was killed in a car accident, she never let me out of her sight during the months following when I would shed tears several times a day. I did not think I could love another dog again (Star was my first dog) but a year ago, we adopted a cocker spaniel/poodle mix rescue dog named John Henry. He has been such a joy and profound delight to my family – and, like most abandoned or abused animals, is so very grateful and excited to receive every bit of love and affection we give him. I am praying right now, knowing that your new soulmate is out there somewhere. And that dog will be so lucky to have you – just as Teddy was so fortunate to be loved by you for all those wonderful years. So very sorry for your loss. My heart breaks for you. Our granddog, Molly, looks so much like your Teddy. Such sweet, loving dogs. Molly will be 12 this December and is battling arthritis also. Gods peace be with you as you mourn. I am so sorry for that heartache you are feeling. I know how inescapable it can be. I am glad you had sweet Teddy in your life and have lots of memories to hold on to. Thank you for sharing him with us. I just received your post and my heart goes out to you and yours. Teddy was a as lucky to have your family as you were to have him. I have been sobbing through your whole post and I didn’t eve “know” Teddy. I had to put my dog to sleep in 2000 and when I read what you had to say about Teddy, it brought back all those memories. We love our pets so much and received so much enjoyment from them, but when they die, it breaks our heart. I remember for days after Sheba’s death, I thought I heard the bell on her collar. She would always be at the top of the stairs waiting for me to get home, but she was no longer there. Times heals the pain….but I know when I get to heaven…she’ll be there. Oh the tears in my eyes as Teddy’s loss brings back memories of golden’s past. Our dear Loki is 8 years old and has lived longer than our last two dogs. We call him “our compliant child”. He is a gem. I am so sorry for your loss. Cherish his memory as I know you will, my blogosphere friend. So very sorry to hear of your family’s loss of beautiful Teddy. We have had to go through this ourselves in the past with our furry children and know how difficult it is letting go. It is a process, but with time it will get easier. I hope the wonderful memories you have of Teddy bring you comfort. May God bless you and your family. Tina what an amazing post. I’m so sorry for your loss, but so happy he brought you so many years of happiness. It is the hardest thing to say goodbye to our pets! What a moving tribute to a wonderful and beloved pet! I am so sorry for the loss of your dear Teddy, Tina. I am sitting here crying my eyes out as I read about your loss. Teddy brought you so much love and happiness. Hold on to those precious memories. You were truly blessed to have him in your life. Oh dear Tina, just got home from Europe last night and saw this heartbreaking post. Tears are running down my face as my heart aches for you and your family. While away all I could think of was my beautiful Russian Blue cat of sixteen years eagerly awaiting my return home. Teddy has become so dear to me as I’ve followed your blog. How I wish I could ease your grief. He gave you such Joy and you gave him permission to be at peace. Teddy is not gone he has just moved on to the other side of the veil. Although you’re so can’t see him he is near to you. I will share a miraculous event regarding this another time. So very sorry to hear of the loss of your beloved Teddy. I know he will live on in your heart and your memories. I wish you and your family peace. What a wonderful and loving tribute. I have not been able to receive your emails and I am just now reading about sweet Teddy. So very sorry for your loss. He seemed like such a sweet and gentle soul.